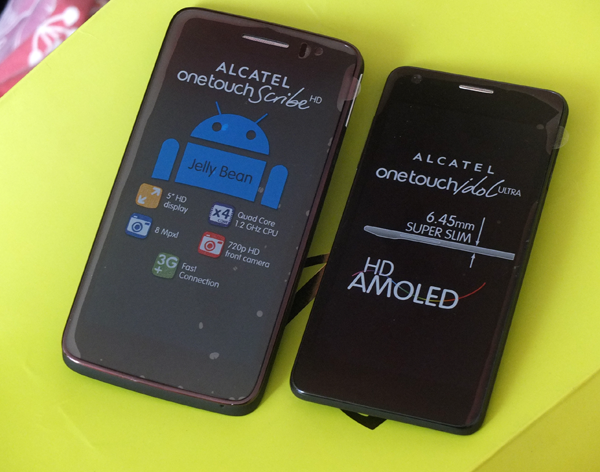 The sleek and slim smartphones shown in the photo above are the actual Alcatel One Touch Scribe HD and Alcatel One Touch Idol Ultra, which are among the long list of Android mobile devices Alcatel recently launched. The Alcatel One Touch Idol Ultra, which already runs on Jellybean and powered by a dual core 1.2 GHz processor, sports a 4.7-inch HD AMOLED display and is only 6.45 mm thin. It also features an 8.0 megapixel camera. It obviously lacks a standard RJ45 jack for a headset. The Alcatel One Touch Idol Ultra, which also features an internal storage of 16 GB, has a suggested retail price of Php14,990. The Alcatel One Touch Scribe HD features a 5-inch HD screen. It comes with pen accessory for doodling or sketching and MagicFlip cover. This 3G device is powered by a quad-core processor and already running on Android Jellybean 4.1. Alcatel One Touch is a brand within TCL Communication, an international multicultural company which designs, develops, and markets globally a growing range of mobile and Internet devices. TCL Communication is one of the fastest growing of the world’s top ten mobile phone manufacturers. It makes access to mobile technology simple, designing their products around individual’s lifestyles, enabling the end users to do more. TCL Communication is a public company listed on the Hong Kong Stock Exchange and part of TCL Corporation, one of the largest consumer electronics companies in the world.